The Rake Magazine is a man's ultimate lifestyle magazine featuring fashion, interviews, photography and everything else the modern man should know. It is dedicated to the renaissance in gentlemanly sophistication and style, THE RAKE recaptures the codes of classic men’s elegance. Inspired by icons such as Cary Grant, Fred Astaire, the Duke of Windsor, Gianni Agnelli, Sean Connery, and their contemporary counterparts. 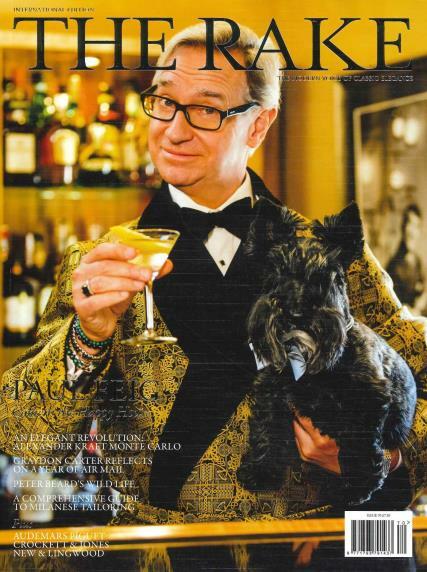 The magazine provides incisive, in-depth commentary on magnificent menswear, and the many other elements of gentlemanly living, from manners and ethics, to art and design, tasteful travel, health and well-being, the intellectual and philosophical, to homes, modes of transport, entertainment, food and drink. THE RAKE is the modern voice of classic elegance.